Other significant large-scale projects include: Before E-commerce: The History of Mail Order Catalogues in Canada, a virtual exhibition for the Canadian Museum of Civilization http://www.historymuseum.ca/cmc/exhibitions/cpm/catalog/cat0000e.shtml, and research for the related travelling exhibition Rail, Mail and Retail as well as a comparative analysis of the Toronto and Winnipeg editions of the Eaton’s catalogue; and Inventive Spirit: Alberta Patents from 1905-1975, published by the Red Deer Museum, and Alberta Inventors and Inventions http://www.abheritage.ca/abinvents/index2.htm a virtual exhibition developed by the Heritage Community Foundation. She wrote Invention Prototypes in Museum Collections for the National Museum of American History, Smithsonian Institution on the value collecting prototypes. 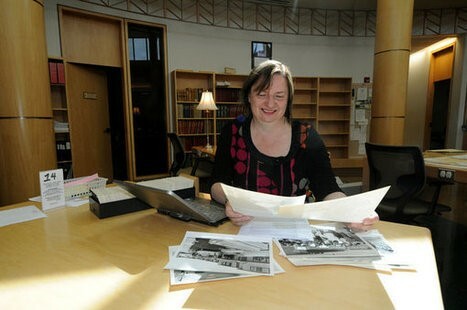 Catherine C. Cole researching local history in the Provincial Archives of Alberta, May 2012. Credit: Edmonton Journal.